Ahem. Yes, hello again, in a grovelling sort of way . . . I now know that starting up this new blog was a sure way of making a)my days suddenly grow busier and b)several electronic devices fail on me nastily, of which more anon. ANON? Please do note that deft twist of literary language as it links into something I spotted in the news today. On 17th October, the post below was my piece for the month on the History Girls blog. 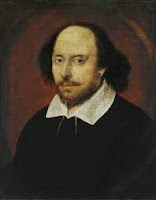 I wrote it after going to The Globe to watch Emma Rice's production of Morpurgo's children's novel, ending the post with a few extra thoughts about lighting and effects in "Shakespeare's theatre". Those comments seem even more relevant today, with the news that Emma Rice will be stepping down as Director of The Globe at the end of next summer's season over the lighting issues. I suspect this matter of "natural light" must have made the season painful for many involved, although there were obviously highs like the broadcast of her "Midsummer Nights Dream". I'm hoping that Emma Rice's talents will soon bring her vision a happier home elsewhere. Meanwhile, I'll be looking forward to seeing "946" and Tips at the West Yorkshire Playhouse at the start of November. Read on - and do visit the History Girls blog too, if you haven't already. There's a new posts by a historical fiction writer there each day of the month. Today’s post is about a play – and a novel - for young people based on a historical event and performed at a historical place. As soon as I saw that the Kneehigh Theatre Company was at The Globe on London’s South Bank in September, I checked dates and booked tickets. Although the Cornish-based company occasionally tours to Leeds, I wasn’t sure if that would happen with this show. So London it was. I particularly wanted to see how they would dramatise THE AMAZING STORY OF ADOLPHUS TIPS, a children’s novel by Michael Morpurgo, the author of WAR HORSE. The story is another “animal & war” tale, written in his classic, thoughtful style which was why I could not quite imagine how the story – and the history behind it - could be translated for the stage and for a family audience. I had hopes: Kneehigh has a wonderfully theatrical approach. Although their performances feel emotionally real, what the audience sees is not realistic in the TV or CGI sense of the word: the company uses a cast of multi-talented actor-musicians in a variety of roles as well as puppetry, music, song, dance and movement and seem able to tread between from moments of raucous humour to intensely moving sensitivity. 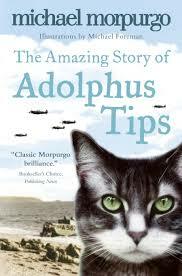 “946: THE AMAZING STORY OF ADOLPHUS TIPS” is set during WWII. Ostensibly, the story is about a twelve year old girl trying to find her lost cat, yet it is also about the pity of war and the changes that war brings to ordinary lives and places. Michael Morpurgo, as ever, reminds us of the histories that one generation should share with those that come after. The inspiration for Morpurgo’s book was both the requisitioning of Slapton, a remote, rural village in Devon in1943 and the disaster that happened there. 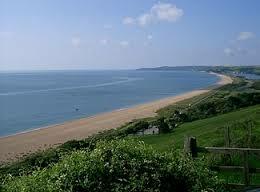 The military had noticed that the wide, sloping beaches of Slapton Sands were similar to the Normandy coastline and therefore chose that area to stage Operation Tiger, an intentionally realistic, don’t-turn-back rehearsal for the D-Day landings. During the preparations, as American troops flooded into the area and landing craft gathered along the Devon coast, the local villagers had to make arrangements to leave the homes, farms, livestock and land and all that everything that had been part of their lives for generations. Even then, the rehearsal did not go well. When German U-boats were spotted in the Channel, a mismatch between the British and American coding systems blocked radio warnings and the landing ships, full of troops and sailors, heavy equipment and vehicles were torpedoed. Many men were maimed, killed or lost at sea and, furthermore, the “realistic” nature of Operation Tiger meant that the “live” ammunition was used when troops engaged on the beaches. Afterwards, Morpurgo found, that although there had been local rumours of the disaster, a news black-out was imposed. Morale had to be kept high for the proposed D-Day landings and so the tragedy remained an official secret for many years, both in Britain and in America. 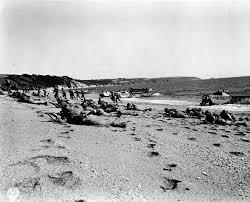 The number chosen for the show’s title - 946 – is quoted as the number of G.I’s who died at Slapton Sands. A grim event, and I could not help wondering how Kneehigh would manage this uneasy subject. ”Yes, there will also be singing. Slowly, as a model farmhouse - complete with a smoking chimney - is carried on stage, we are shown a country backwater in miniature: a small Dorset farm, surrounded by tiny puppet sheep, a small black and white sheepdog and a delightful boy-puppet playing “keepy-uppy” with his football. In moments, that tiny scene expands to human scale. The small collie becomes a full-sized puppet collie, and we are inside the remote farmhouse with strong-minded Grandma, poorly Grandad in his wheelchair and, gradually all the family, especially Booey, the grandson and narrator. The grandfather is, very gently, dying. Grandma, clearly dominant, takes Booey out on a motorbike, recalling how she and her ailing husband used to travel, “Supreme!” she declares, a refrain that echoes throughout the play. Then, after the funeral, she announces she is setting off on a secret adventure, to do something she has waited until now to do. If you have read any Morpurgo books, you will recognise his familiar time-slip structure when you see Grandma gives puzzled Booey her girlhood diary, briskly telling him that if he reads it – twelve-year-old Lily Tregenza’s diary - he will understand where she is going and why. As Booey starts reading the pages, time changes and Lily, played by Katy Owen, appears, furiously grabbing her diary out of his hands. A frisky self-willed young girl, Lily is obsessed with searching for her cat Tips who has been in hiding since Lily’s father drowned her litter of kittens. (This is a “told” incident, thank goodness.) Lily, unable to forgive her father, would not say goodbye when he left for war. Thankfully for my emotions, the puppet cat Tips is quite large and not particularly cute or needy: she is a typical farmhouse cat, in fact, and not one that anyone else on the Tregenza family farm worries about, because it is wartime and, short-handed, they are struggling to keep things going. Lily attends the small village school, where lessons are now conducted by a teacher from France, the cruelly-nicknamed Madam Bloomers, who the “children” mock as she circles the stage on her bicycle. The “pupils” act their parts magnificently well, mixing naughtiness, name-calling and argy-bargy, along with acrobatically gliding around their old-school desks, and more. Even there, Lily does not change: she does not love school or rules and her liveliness and cussedness gives the play and story a nicely unsentimental edge. Gradually, Lily and Barry, a dim, kindly boy from war-damaged London, form an awkward relationship, with the headstrong Lily delighting in taunting the love-struck Barry throughout he play. The whole “school cast” worked excellently, especially in a wonderfully raucous scene where Lily angrily suggests that Hitler and Churchill should settle the war between themselves rather than making everyone else fight the war for them, an idea demonstrated through a trio of children’s street games using rounds of scissors-paper-stone, a clapping pattern contest and a rather unequal skipping game at the end of which a Hitler figure is driven, snivelling, off-stage and a brash, triumphant Churchill celebrates with a tour-de-force on the skipping-rope. Morpurgo was very involved with the Kneehigh Company’s adaptation, and I could not help noticing how subtly scripted the language was during these moments and the whole play. For example, the Nazi party is blamed, rather than the German nation as a whole, and although the children may be thoughtless, once they hear that their teacher’s husband has been drowned in a naval convoy, their behaviour immediately changes to sympathy, and for once the sight of school recorders brought peace and joy. All the way through, the first half is full of activity and sound: the recorders sing tunefully, the tractor rattles around the stage, puppet hens squawk and small farm animals cause havoc. Even the elusive Tips appears for a cuddle now and then. 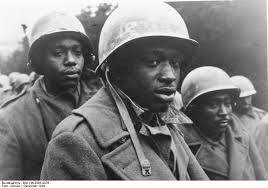 However, the schoolchildren’s biggest surprise comes when Adie and his friend arrive in the classroom, asking for directions for their jeep: the children meet two black American soldiers, at a time and in a place where they would have been an unusual sight. Lily is totally enchanted by Adie, especially when the two G.I’s visit the Tregenza farm. Moreover, the soldier’s involvement, culture and cheerful friendship is emphasised all the way through by the music from the band on-stage, up in the gallery, descending to act their parts by ladders or skinning down the pole. 946 is full of “American” music - jazz, jitter-bug, gospel and more – and with never a single lute in sight. I felt that the play is noisier and ruder than the original novel and once, rather mistook the book’s mood for me. When Barry’s larger-than-life bus-conductress mum visits the farm, her comic drag role rather overwhelmed the Ivy from the page, who I’d thought of as a helpful, extra pair of hands whose bustling ways had stirred the grandfather out of his mood of dejection. This book Ivy was hidden by the dramatically loud wails of protest about the awful green of her country surroundings. - the communication error is signified by two string-and-can phone-sets ( one colour British, the other American) the lines crossed but unconnected. - an almost ritual acting out of the disaster, where G.I’s carry model ships forward to a rank of water-filled tin baths, like toys in the game of war. - religious symbols: as the people leave the village, both the vicar’s church candlestick and the teacher’s menorah are carried among the precious possessions: this is not a one-faith confrontation. The production offers much to think about, not only the fact that life was changed for all in that community by those times. Lily’s “journal” concludes, ending with runaway Tips being brought home and the plot returns to the “present” of the early scenes. Where has Booey’s Gran gone? Who will look after her when she comes back? Who will the old lady live with? The squabbling family are waiting at the airport to find out . . .
Emma Rice’s production sharpened all the emotions and strengths of the Amazing Story of Adolphus Tips book, lightening it with humour and bringing sparkle and life to both the past and “present” stories, and there is much in this busy production that I would have liked to include but could not. You'll find a flavour of the show here. However, at the same time, I was aware that The Globe was dressed for a twentieth-century war story. The familiar painted stage - see below - was stacked with sandbags or “protected” by wooden planking. Each pillar carried a large aeroplane propeller that whirred into action at significant moments, the music and sound was amplified and at one point a glitter-ball rotated under the Shakespearean canopy. This production meant a big change for The Globe, which was created to be as authentic an experience of Shakespearean theatre as possible, a theatre where costumes were laced and tied and where the great Round “O” would respond to the sound to human breath. Now – though not all in a single move - there are zips and electricity. 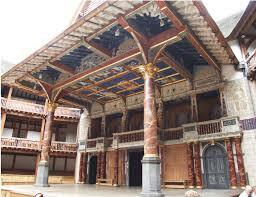 Emma Rice of Kneehigh is now the Director of the Globe so it will be interesting to see how Shakespeare will be played here in future. Her Midsummer Night’s Dream, recently shown on television, was much more in the vibrant, cross-dressing Kneehigh style than in the “authentically historic” tradition. Is this change a loss and if so, does it matter? Or is it a matter of “bums-on-seats” accountancy?